PhoneTorch provides functionality to use your Nokia X7 (and other mobile phones) as a torch/flashlight. 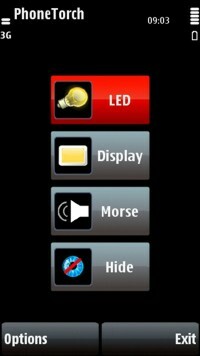 It supports both, the phone's LCD screenlight, and the phone's flash LEDs (video light) as light sources. If you have an other phone than the Nokia X7 click here for a version of PhoneTorch for your phone. Purchase and download PhoneTorch for Nokia X7 here.